back cover of this issue! QUESTIONS OR COMMENTS? Please email Sarah Lee at slee@kalfound.org. What your professional advisors should know We are in the throes of tax season. “It’s easier when I can see how much a client has given historically,” Gallagher says. if money were no object?” This question reveals where clients are truly interested in directing their resources. PA about charitable giving. “Teaching kids about giving builds empathy and stronger family connections,” Nelson observes. a Donor Relations Officer at 269.381.4416 to start the conversation today. raises the prospects for her children’s success. It was that idea that prompted staff from the Center for Women’s Services at Western Michigan University, Nazareth College and Kalamazoo Valley Community College to design a new scholarship program for women. They knew that it wasn’t enough to simply provide money for school tuition. So instead of quitting, she asked for help. in 1997 have also provided more than $112,000 in emergency grants for recipients while they are in school. Franklin was already receiving a WEC scholarship for her college expenses. “I used the money for school, books that my financial aid didn’t cover, care of my children,” and similar expenses, she says. When she told her scholarship coordinator about the car situation within days she had a check for enough money to make up what she needed to reclaim the car. The program had worked exactly as its founders envisioned, as a support to remove barriers to success. Kalamazoo Network, and the YWCA. through grants. Over the years a total of 258 women have been given a boost by the program. Women’s Education Coalition to help her earn a bachelor’s degree in education at Western Michigan University. WEC application deadline is May 15. Applications are available at kalfound.org/wec. emergencies” published by Southwest Michigan’s Second Wave. Read the full story at secondwavemedia.com. 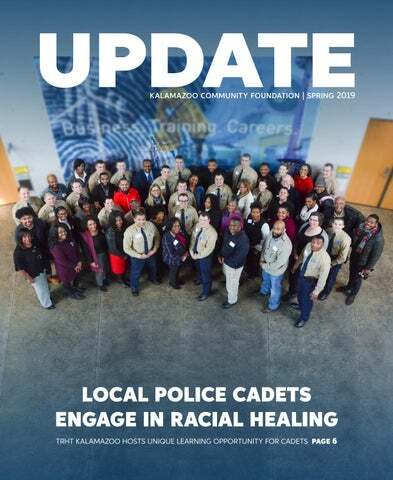 program for 19 cadets at Kalamazoo Valley Community College (KVCC) Police Academy. humanity and increase consciousness, awareness and empathy. a participant responded in the training feedback survey. a retired Public Safety captain. The program was the first of its kind at any of the 20 police academies in the state of Michigan. and communities of color,” Ledbetter said. Meet our new trustees In January 2019, Kalamazoo Community Foundation officially welcomed Sydney Parfet and Von Washington, Jr. to the board of trustees. Parfet is an attorney at Lake, Parfet & Schau, where she focuses on estate planning and estate administration. Washington is the executive director of Community Relations at The Kalamazoo Promise. 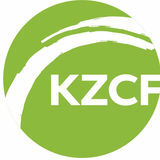 READ THE FULL Q&A AT KALFOUND.ORG Did you catch our KZCF Live interviews with Sydney and Von? Watch them now at YouTube.com/kalfound. get the things they need. I think the Community Foundation does that well and I am excited to be a part of the work. 5th Annual Find Your Cause Thursday, April 11 5 to 7 p.m. Girl Scouts Heart of Michigan 601 W. Maple Street, Kalamazoo, MI 49008 When you picture a philanthropist, what do you see? We hope you see yourself because philanthropy is more than giving money, itâ&#x20AC;&#x2122;s sharing valuable resources such as time and talent to give love to your community. The 5th annual Find Your Cause event, hosted by the Kalamazoo Community Foundation in partnership with Gryphon Place Volunteer Services, is an opportunity to connect with local nonprofits and find ways to get involved with their work in and with community by providing board service, technology assistance, administrative support, legal expertise and more! Dozens of nonprofit representatives will all be in one room to discuss opportunities to address needs in education, housing, human services, youth development, just to name a few. To register and learn more about the event, visit FYC2019.eventbrite.com or call 269.381.1510.